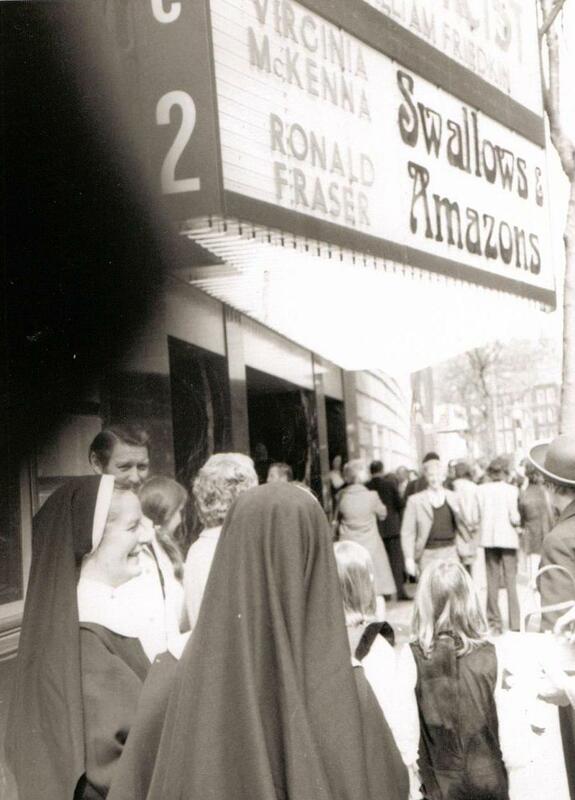 The premier of the feature film Swallows & Amazons was held on 4th April 1974 in Shaftesbury Avenue, in London’s West End. Those who watch it on television today, or have the DVD, are amazed to hear it was first released almost forty years ago. Please forgive me if you have seen this photos before but it seems quite a date to celebrate. The ABC in Shaftesbury Avenue in 1974. It is now the Odeon Cinema. The Royal Gala Matinee was held in aid of the charity KIDS, which works with disabled children, young people and their families. 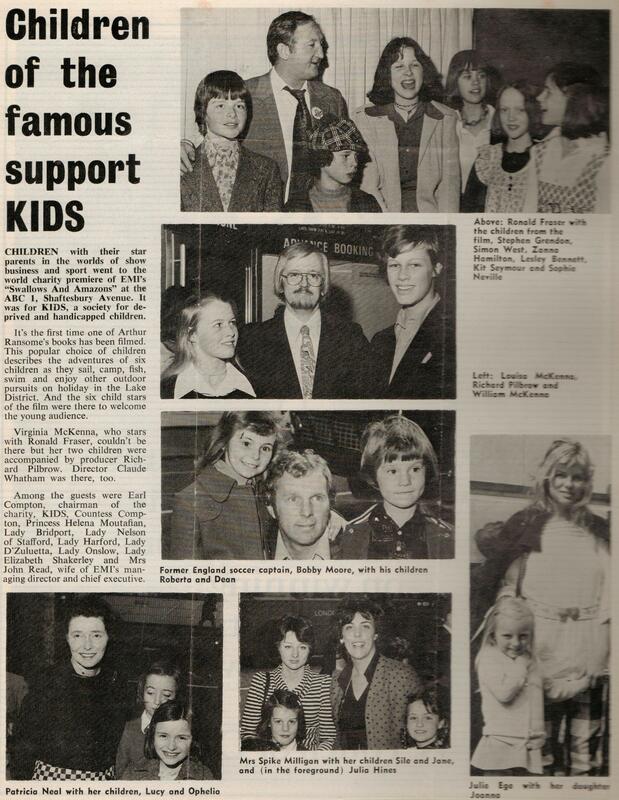 The society is still going strong and has been celebrating its own 40th anniversary recently. 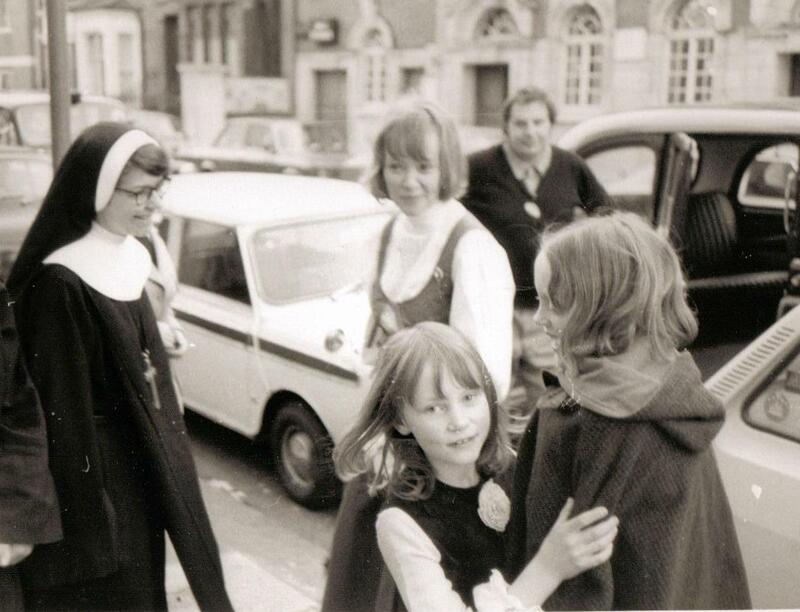 We arrived by taxi with my house mistress, Sister Allyne, and head mistress Sister Ann-Julian, who had travelled up from Wantage in Oxfordshire for the occassion. 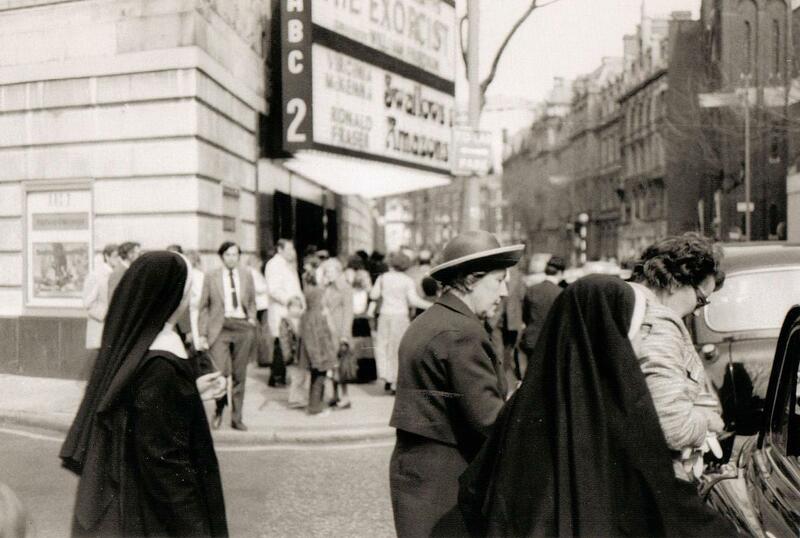 Of all films, they found The Exorcist was showing at the same cinema. I gazed up at the billing outside the entrance, more interested in seeing the names of Virginia McKenna and Ronald Fraser with the romantic design of the graphics spelling out Swallows & Amazons. The first thing that happened was that I was whisked off for lunch with the five other children in the cast by Claude Whatham, the director. He chose a bistro where I chose hamburgers and chips. I’m not sure what the rest of my family did, but can only presume they found something to eat. We arrived at the ABC cinema to find they had already taken their seats in the audience. We met up with Ronald Fraser and Richard Pilbrow, the film producer, who introduced us to Princess Helena Moutafian, Patron of KIDS, who the Earl and Countess of Compton had brought to celebrate the film’s release and help raise funds for the charity. Mummy had instead I made a curtsey to each person I was introduced to. Did this include members of the Press? We also met a number of Ladies: Lady Bridport, Lady Onslow, Lady Nelson of Stafford, Lady Harford and others listed below who must have arrived with their children. It was all quite something. Please note that Simon West, (to the right in the top photo) was wearing a tie that matched exactly with the floral print of his shirt. This was the height of fashion in 1974, something I have yet to see revived or replicated. Suzanna and I both wore pinafore dresses. These have not experienced a revival either, although Suzanna’s Laura Ashley print would be considered a treasured vintage piece. My mother was horrified that Ronald Fraser had his collar button undone, but I think that was a nod to trendy-ness. He also wore a badge in support of the charity pinned to his lapel. Badges were all the rage at the time and collected by all. As you can see, we met Bobby Moore, the Hollywood actress Patricia Neal, the Norwegian Bond Girl Julie Ege and Spike Milligans’ family. Will Travers, now the CEO of the charity Born Free, came to represent his mother, Virginia McKenna who sadly couldn’t be with us. 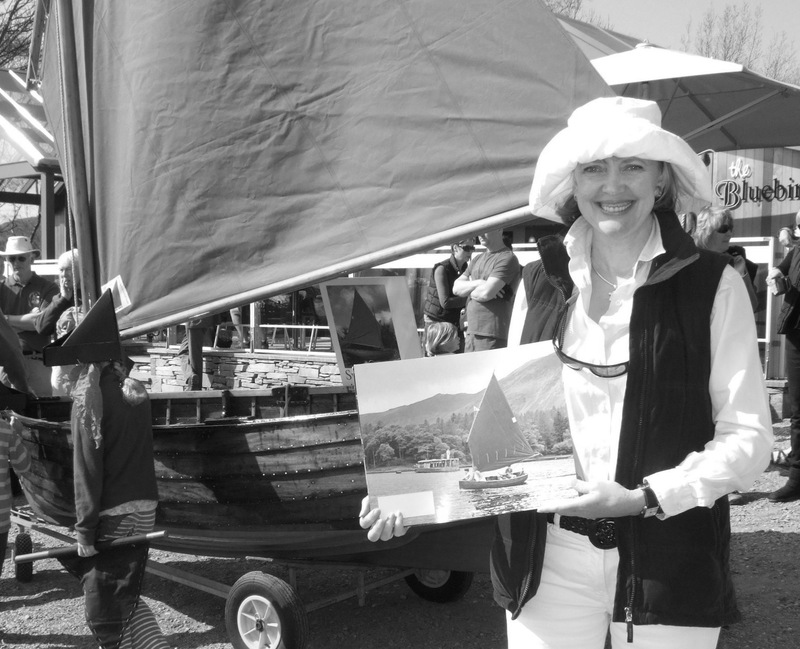 Simon West, Kit Seymour, Ronald Fraser, with Sophie Neville, Suzanna Hamilton and Lesley Bennett also appearing in the action photo onboard the houseboat. It wasn’t until years later that I was shown copies of the stills used to advertise the film inside cinemas. The original film posters, which once hung in the London Underground, have become collector’s items, valued at about £240 each on eBay. Studiocanal, who now own the film rights, have a selection of posters available as framed prints if you click here. This was the version used as an advertisement in the Sunday Times forty years ago. 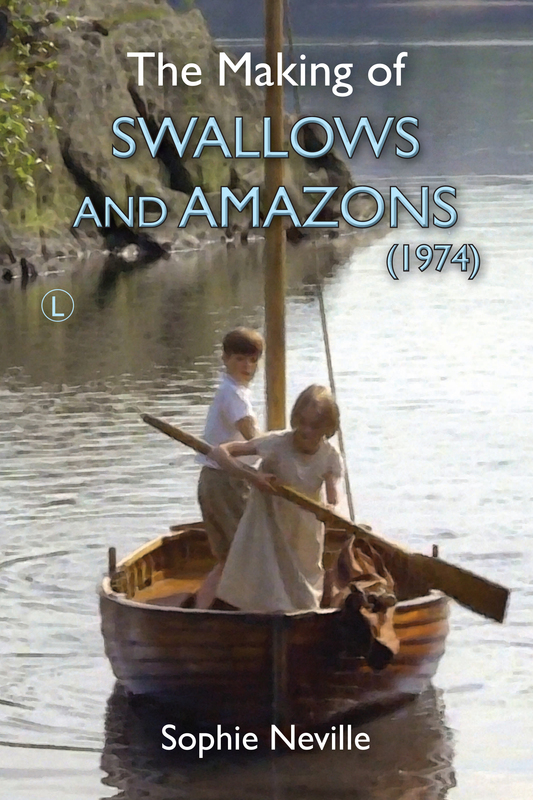 You probably know that ‘The Secrets of Filming Swallows & Amazons’ is currently available as an ebook on Amazon Kindle and for other e-readers via Smashwords. 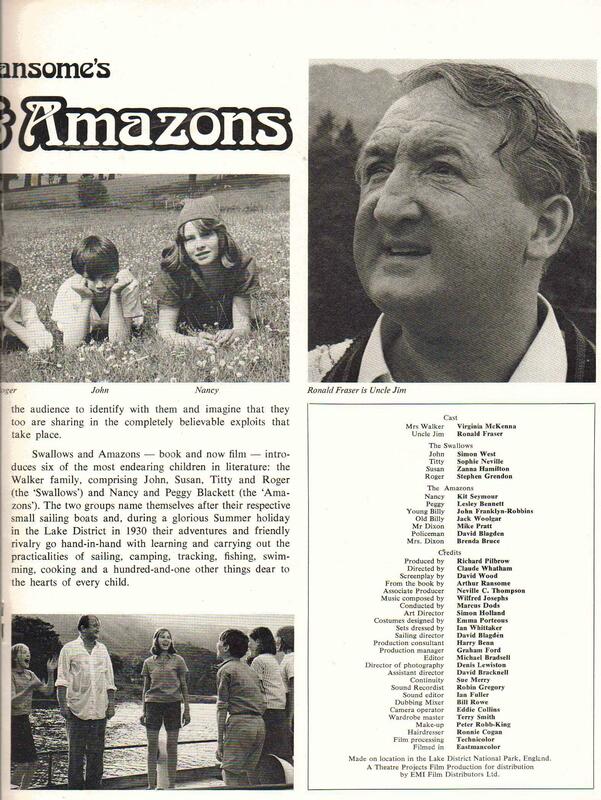 It has been described by one reviewer on Amazon as the equivalent of DVD Extras, as it explains how we made the movie in the Lake District, back in the summer of 1973, as well as how the film was promoted and received in the UK. Hopefully the paperback and hardback versions will be out soon, but the ebook is unique in that it gives links to behind-the-scenes footage shot on location by my parents. 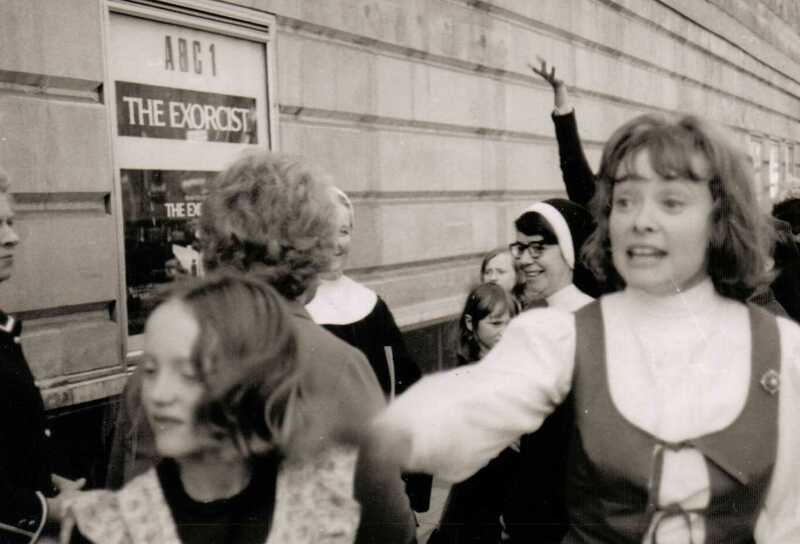 The photo of the nuns by the Exorcist sign is a classic and deserves wider publicity! 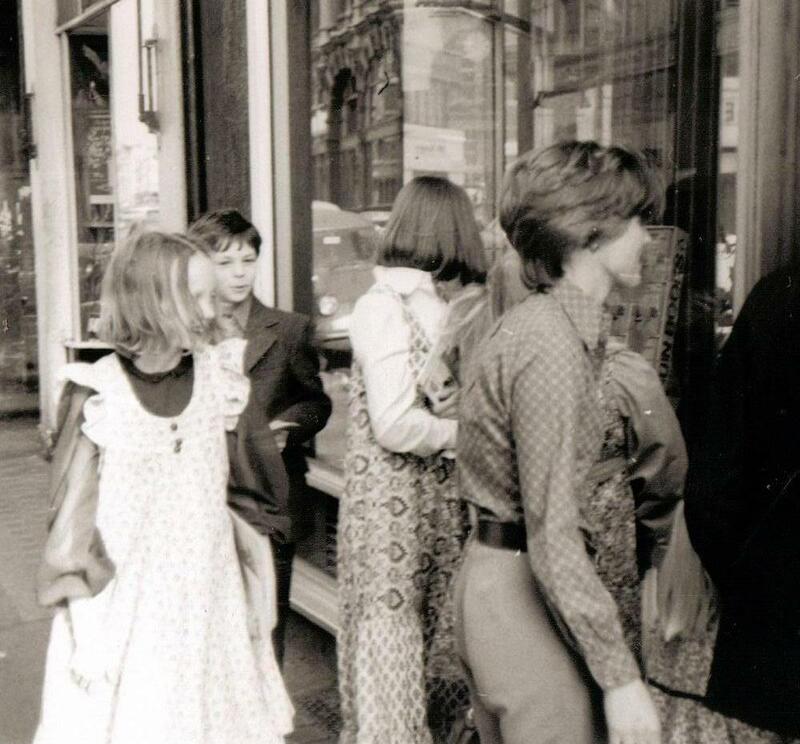 And yes, my own 1974 photos also reveal pinafores and Laura Ashley ….. 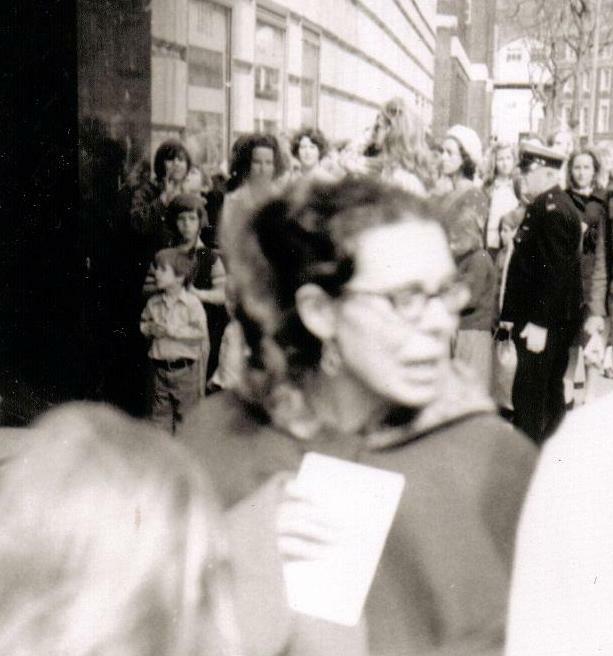 Sadly Dad must have taken the photos in a bit of a rush, but somehow they capture the fun and excitement of the day. I was hugely self-conscious at the time and found it rather an ordeal. I so glad you liked the post. I feel I am repeating myself slightly but that 4th April 1974 was an anniversary to celebrate. Another array of excellent photos, Sophie, including a rare one of Simon wearing his flower-power shirt. I have saved them to my Swallows and Amazons folder. I must say, I didn’t realise that the original cinema posters were so valuable nowadays. I’ve had both a quad (30 x 40 inches) and a crown poster about twice the size, for many years and got them them for a fiver each. They’ve certainly increased in value since then. I shall certainly be buying a hardback copy of the new book The Secrets of Filming Swallows and Amazons when it’s published. I shall order it from my local bookshop. By the way, you have mistakenly typed 2014 instead of 1974 as the year of the film premiere at the top of your article. Thanks so much for pointing out the typo. Deary me. I’ve certainly got a set of the ?ten colour film photos that were hung in cinema foyers. Unfortunately I trimmed them very slightly to fit in a scrap book, but as far as I remember the credits and some white borders are still there. This post has just reminded me that I also had the full-size S&A poster as well. Haven’t seen it for years, a trip into my loft may just unearth it. Amazing. Are you a member of The Arthur Ransome Society? I’m not a member of the TARS, but have often dipped into their forums. 1. Copy of a letter written by AR to my great-aunt, on his usual letterhead, in response to her fan mail request for location information. 2. 1967 clipping of AR’s obituary (from the Guardian, I think). 3. 1-page colour magazine article, probably the Sunday Times, on Ransome, S&A and locations; the usual content. 4. 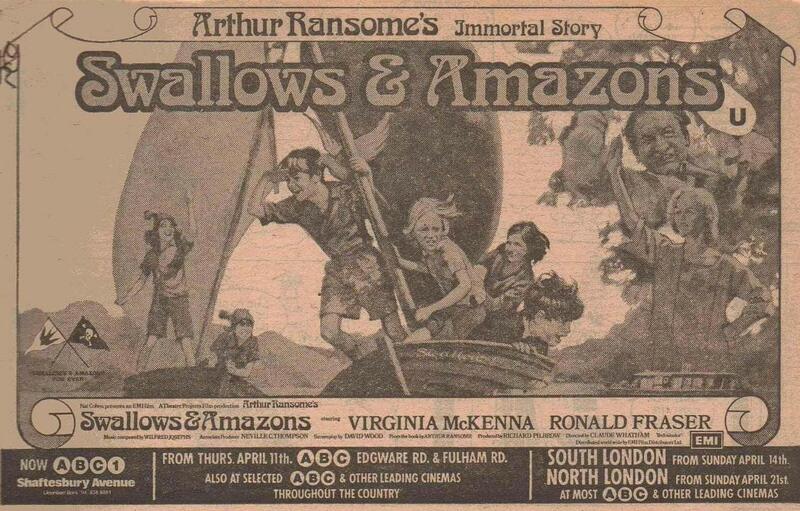 Newspaper advert of the 1974 S&A film, the same as in Sophie’s post above. 5. Small magazine item on the Charcoal Burners (Jack Allonby) used in the film. 6. Newspaper clipping advertising the film at the Scala Cinema, Prestatyn. 7. My review (cringe) of the film, which I saw on 7th November 1974. I was almost 11. 8. Eight full-colour A4-size stills from the film, used in cinema foyers as described in my comment above. 9. Two duplicate copies of a leaflet programme for the showing of the S&A film at Theatr Clwyd Theatre, 26 – 31 July 1976. With credits, synopsis and a review by one Penelope Houston of the Monthly Film Bulletin. Only items 1,9 and 10 are loose, the others are very firmly glued into place! But could easily be copied. Let me know if anything is of interest to you Sophie. Thank you so much for listing all this amazing material. I would love to see it. Do you have a scanner?! I would love to have scans of 1,2,3,5,6, & 9 – just to use on blog posts. I think I have the other images. I could ask StudioCanal if they would like to see them. I am currently drafting a Blog post about the charcoal burners as some new photographs have been sent in. The other item of great interest is your aunt’s letter from Arthur Ransome. I give a talk to TARS members about the locations and know they would be fascinated. Where did you get the film poster? It is so good to hear you have one. I once saw one advertised on the internet for £240. I have two colour ones here and two enormous sepia ones that I would use as wallpaper if I had a big enough loo. Simon – I’ve just posted the article on the charcoal burners that you so kindly sent me. I’ll add the other downloads when I can fit them in. Very many thanks again for taking the time to find and scan the material. It will be appreciated. I have scanned all the items. Let me know an email address I can send them to, or I can send you a link to the scans using something like Dropbox. You can contact me at hodders@gmail.com. The film poster was kindly sent to me by the same cinema manager. It is huge, and very impressive. It was nice to see it again but if you can think of a more worthy home for it than my loft then let me know. Thanks so much, I will email!